Stalk prehistoric mastodons with Florida's first big-game hunters, or travel even further back in time, when colossal sharks cruised the warm tropical seas that once covered Southwest Florida. See ancient shell tools and ceremonial masks and dig up the facts about the Calusa Indian civilization that flourished here centuries before European explorers first set foot on the Gulf coast. Trace America's little-known wars in South Florida, the heroic journey of the Seminole people, and the origins behind traditional crafts like patchwork, once laboriously stitched together on hand-cranked sewing machines. Experience the daily lives - and utter isolation - of the first settlers and their families as they arrived on this watery frontier a hundred years ago, and share in the vision of a self-made multi-millionaire who dreamed of taming a wilderness swampland the size of Delaware. Along the way, we'll introduce you to the hardy and colorful folk - the cattlemen, clam diggers, trail blazers, plume hunters, hermits, loggers, railroaders, rum runners, Crackers and Indian traders - who wrote the pioneer history of Collier County. 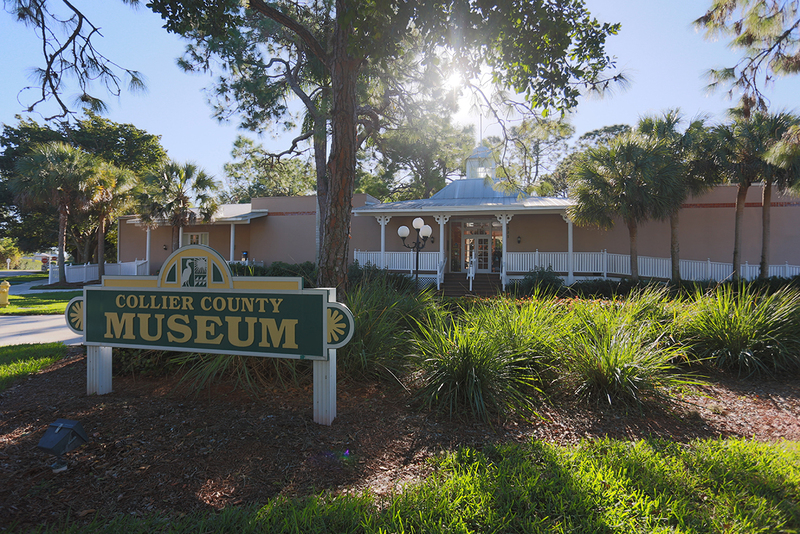 Nestled on five acres of native Florida landscaping, our flagship museum at the County Government center in Naples offers newly created exhibits and galleries that capture the full panorama of local history. Pack a picnic and linger a while in the museum's shady backyard. Then do a little exploring on your own in our native gardens, restored Naples cottages, the archaeology lab, Seminole village or Calusa Indian camp. Enlarged twice, the museum's main gallery offers over 10,000 square feet of new displays, plus a traveling exhibit room, and lecture hall.